Teachers regularly ask students in first and second grade to find details and reasons in a text. While this request is valid, many students don’t understand what really constitutes a concrete reason. The six ideas on this chart provide guidance to help students look for specific types of things. 1. I ask students to share what types of careers they want to have when they grow up. As students share, I write their ideas on the board. We spend about ten minutes discussing the different jobs. 2. Th en, I shift gears and tell students that the sentences in books have jobs, too. I really ham it up and act like this is a big, important secret. You guys didn’t know that, did you? Oh, yeah, it’s true! 3. I lead a discussion about what possible jobs a sentence could have. Students get really silly and come up with all types of wacky ideas. 4. Finally, I tell students that in an informational text there are lots of sentences that support the main idea or point. These sentences are called reasons. Reasons can have six different jobs. 2. 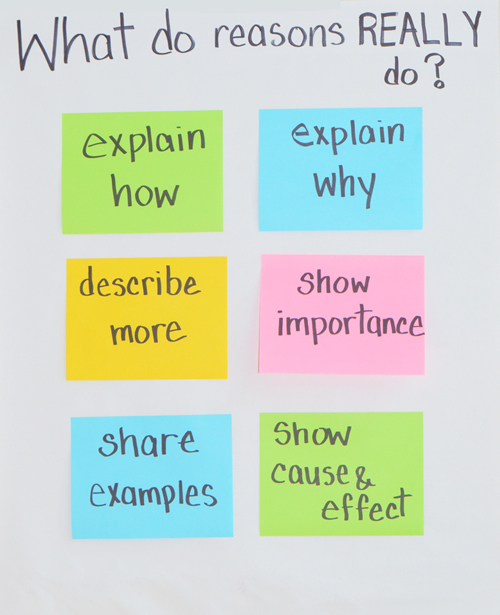 Move directly into your science or social studies lesson aft er creating this chart. As you read text, stop at different sentences to ask students what job they think the sentence or sentences are taking on. 3. Send teams of students on a scavenger hunt to find sentences that function in these different roles. Reconvene as a whole group to share ideas.